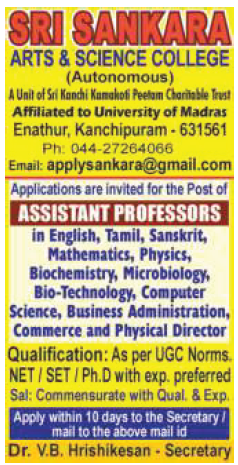 Sri Sankara Arts and Science College, Kanchipuram has advertised in THE HINDU newspaper for recruitment of Assistant Professor / Physical Director jobs vacancies. Interested and eligible job aspirants are requested to apply within 10 days from 07th April 2019. Check out further more details below. About College: Situated in a sprawling 15 acres campus the College is accessible easily from the Madras-Bangalore National Highway also and has been equipped with good permanent buildings, Laboratory, Library, Playground and Hostel. A recent addition has been a most sophisticated IT lab consisting of 100 Computers, Three Servers with Windows and Multimedia, Internet and Web facilities.